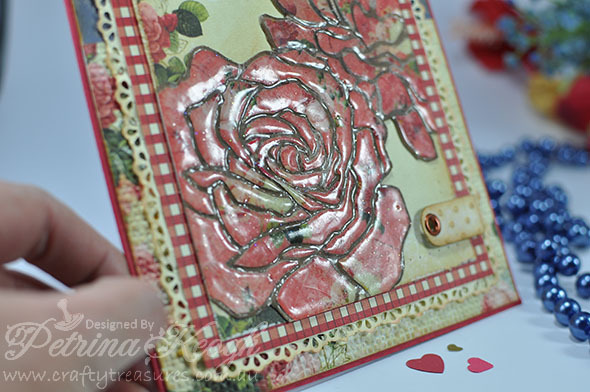 Hi Crafty Friends, I have another tutorial for you all, this is a follow on from my first tutorial found Here. I made 2 card designs for this technique, the 1st design can be found Here. The letters I made with air dry clay and a push mold, I made them a while ago now, and filed them away for a rainy day….as we do!, we have had plenty of rainy day recently! I painted them with matching acrylic paint and stamped them with a Prima stamp. The Martha Stewart punched edge I screwed up in my hand for a more distressed look. 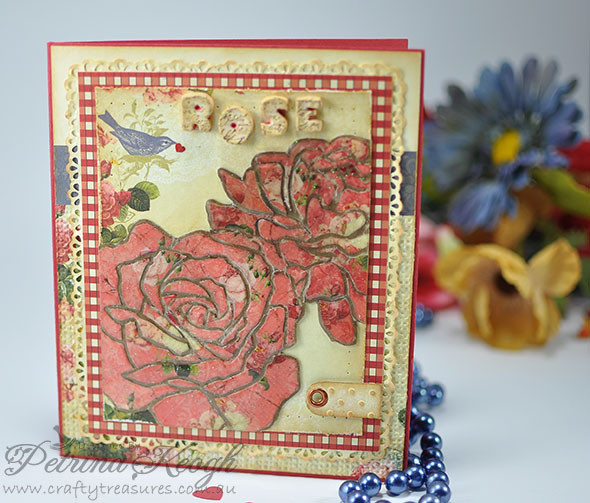 The bottom printed layer was embossed with Stampin’ Up! – Embossing Folder/Square Lattice. 1. 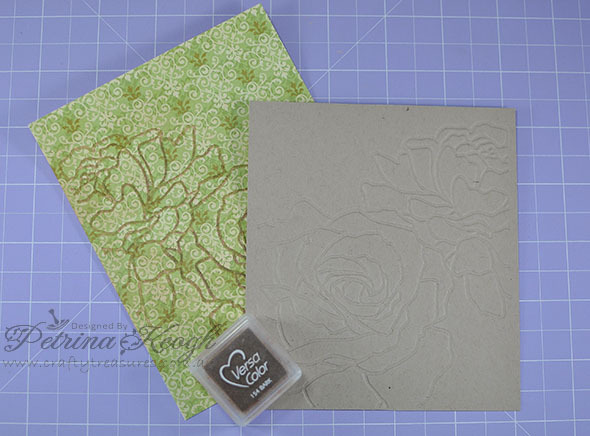 Take the plain piece of card stock (SU – Crumb Cake) and emboss it with the Manhattan Flower embossing folder. 2. 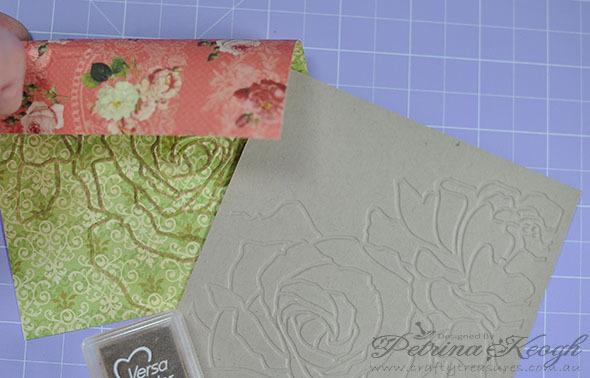 Place the pattern paper Webter’s Pages DSP into the Manhattan Flower embossing folder with the printed side you wish to use facing the back of the folder (the front has the small logo in the bottom right corner). If you are using double sided paper, have the printed side you wish to use facing toward the back, away from the logo), and emboss it. 3. You should have both pieces embossed now. 4. On the back of of the printed paper (or the back of your double sided paper, Webter’s Pages DSP), with the pigment ink lightly scuff over the raised areas. Preferably use a colour, that shows up on it. (I did not use a dye ink, as the dye ink will most likely bleed through to the other side). 5. Step 4 above just makes it much easier for you to see it for step 6 below, whether you use plain colour paper or double sided paper with a print on this reverse side. 6. 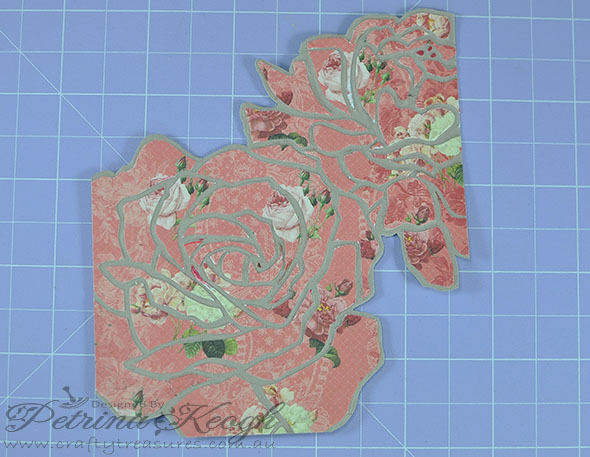 Start cutting the pieces out with the scissors, making sure you cut just inside of the lines marked for each segment. 8. 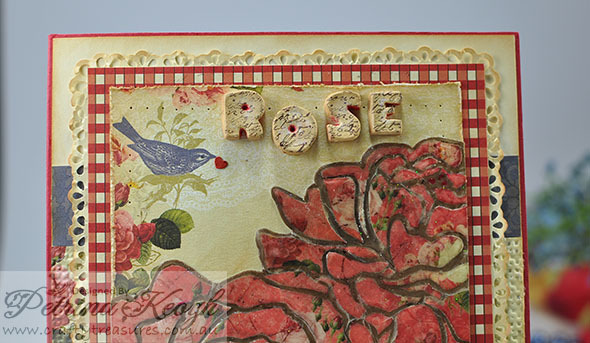 I cut each rose and placed them into their separate piles for this tutorial. NOTE: But I have also cut and pasted as I go. I think it was a lot easier, so try it this way first. There are really no 2 pieces the same when it is all cut out, but the smaller pieces may confuse you. So if you cut and paste each one as you go, u can’t go wrong. 9. 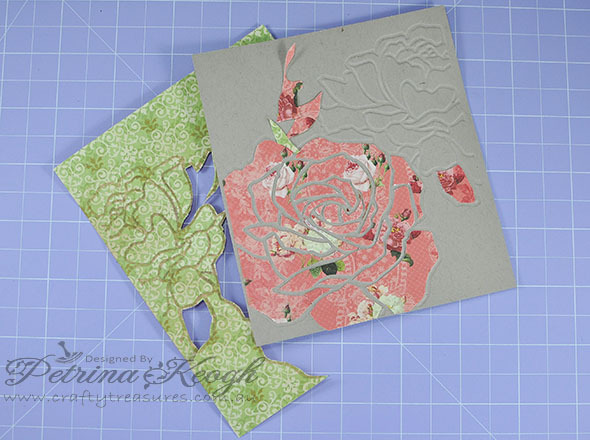 On the debossed side of the plain card stock, start gluing your printed pieces you have cut out. I used the Mono multi liquid glue, you have a bit of slip time, for perfect alignment. Note: Keep it thin near the edges when gluing, so it does do have an oozing effect, that can end up quite sticky and messy!!). 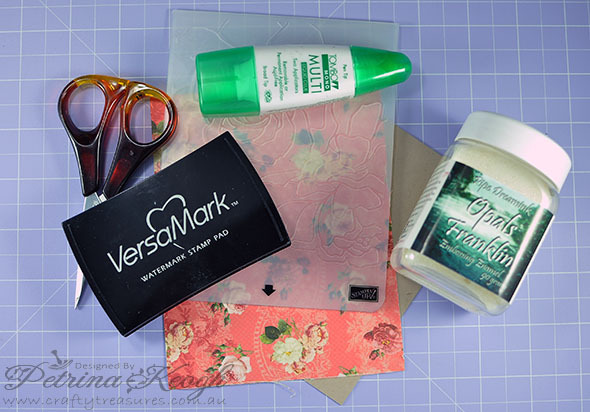 10.Trim your project piece out to the size you want and give it a good coat of Versamark, making sure you also get into valleys (a make up sponge works wonderfully for this). 11. 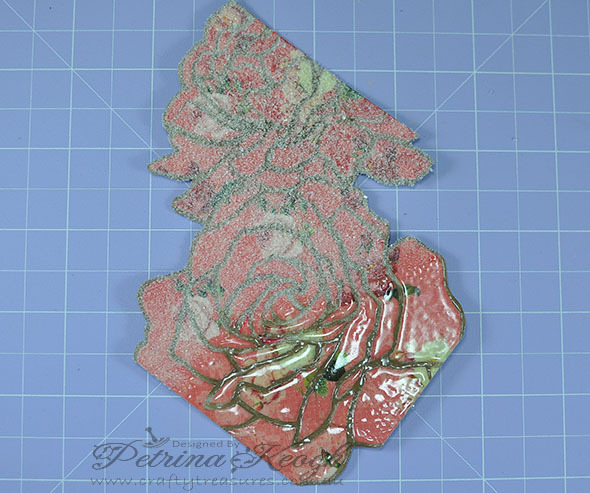 Give 2 coats with Utee, I used (Pipe Dreamink – Opals/Franklin/Embossing Enamel) and heat emboss it. Looks fabalicious, doesn’t it! This is the finished piece. I made 2 different designs again, just for fun, hopefully you gain some inspiration and give this a try, I would love to see your lovely creations.